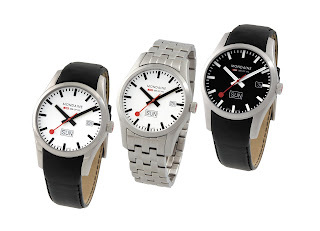 Mondaine has just announced its 2009 Fall collection. The first is the square watch. 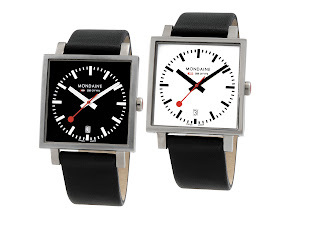 The watch rendered in the desirable black and white graphic that is Mondaine. The watch is available in 2 sizes, 36X36 mm and 22X22 mm. 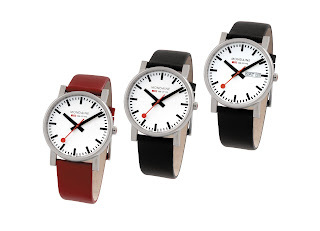 These watches will be offered in either polished or matte-brushed steel. The new EVO 38 mm watch. This new watch will complement the current EVO series. The watch will be in stainless steel and fitted with mineral glass. It is offered in 2 versions, Time and Day-Date. The watch will only be offered with white dial. Also there will be a new Retro Chic model. The new ladies Retro Chic will feature a curved sapphire crystal and an integrated leather strap rendered in red. The men version will now be offered with a bracelet.